So, not a bug or a glitch or anything, but I noticed a weird green spot on the Moon. I don't know if this constitutes a bug or just an oversight, but when I uncheck "procedural" planets / stars / galaxies in the view panel, I can still search for and find/fly to these celestial bodies in various places, even though they are physically invisible. -When I right click on a star, and search planets, the procedurally generated planets still appear. 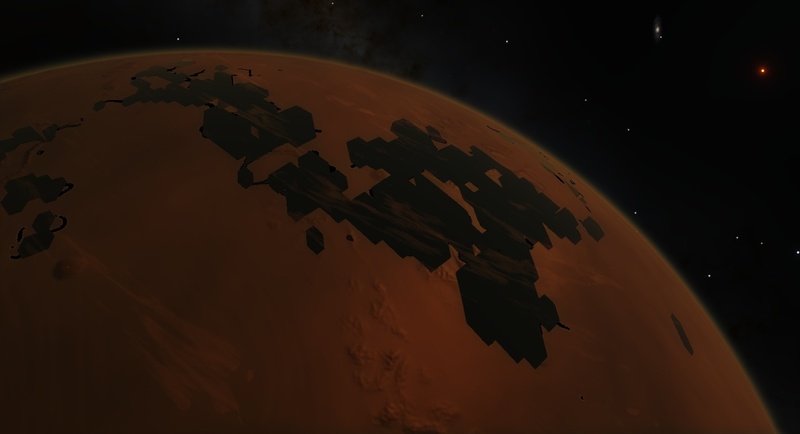 Basically, unchecking procedural planet/star/nebula only stops the rendering, but does not remove the reference. I suppose that is a coding thing, but it would be really nice if the game actually hid those references too. Rings don't eclipse the star's light. A shadow is casted at the planet's surface, but landing on that very spot and looking at the star will show it in full brightness. Earlier versions eclipsed the star. Edit: I... posted this on the wrong troubleshooting thread. ignore this post. Hi, I've been having issues with running SE, and I've tried finding a solution to the problem myself for several hours, but I've come up empty and I'm not sure what to do. I've update SE to version 0.9.7.3, but this issue happens on 0.9.7.2 as well. When I run the program, everything runs smoothly for about a minute and then lags really bad, lagging for about a second, every other second non-stop. Like it is stuttering. It only stops when I press esc to go to the menu, but continues immediately when I try to play again. I've made sure my drivers are up to date. I tried uninstalling and installing SE again. I don't whether this is a problem with Windows 10 or not, because in the past earlier versions of the program seemed to work fine when I was using Windows 7. If I rename atioglxx.dll file the SE loads fine. I assume there was good reason why this file had been included by default,right? I assume there was good reason why this file had been included by default,right? It was, but is no longer. Under Windows 10 or latest ATI drivers this DLL should be deleted. Has anyone here managed to run Space Engine on Radeon 4850 512 MB without those horrible graphic glitches on planets. 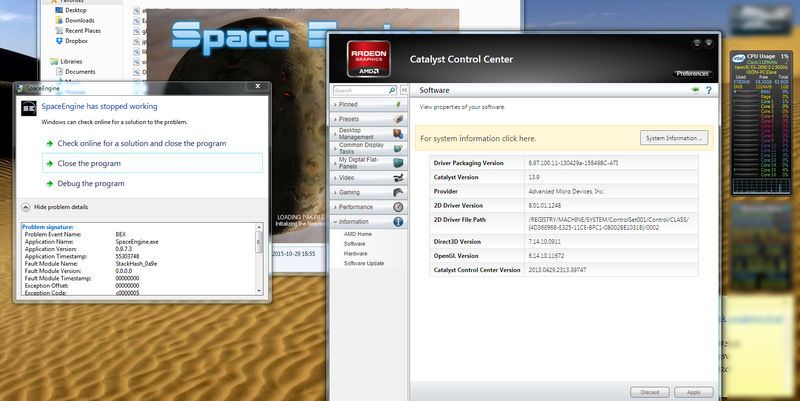 Not to mention that SE lags like hell on my Xeon E5-2690 2.9Ghz (8C/16T) with 64 GiB of ram. Does SE use more than one thread? I'm asking because it is weird that even music stutters when load icon appears in right top corner. Fast GPU is more important for SE than CPU. And 512 Mb is too small VRAM for it to run normally. SE uses multiple threads to generate stars, galaxies and planetary systems. But it uses GPU to generate planet surfaces. Also, music player is working in the same thread as renderer, so it can shutter if GPU is not fast enough. I'm sure this is already known by the developing team, but I mention it anyway. 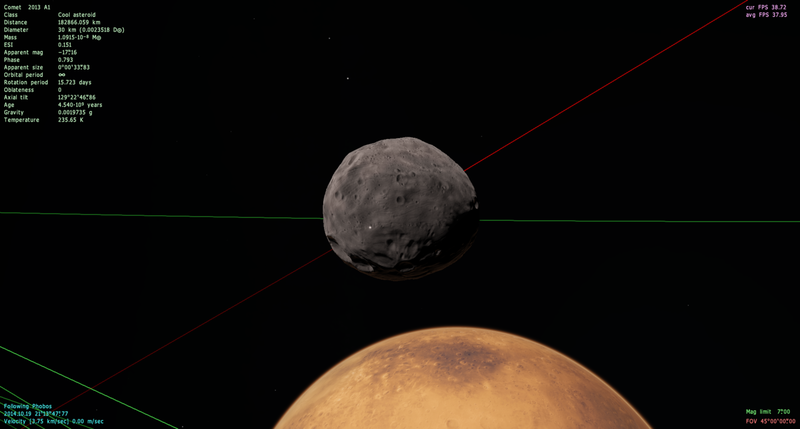 Eclipsed moons enlighten planetary dark sides. 3marproof, please post your se.log file as described in the opening post.